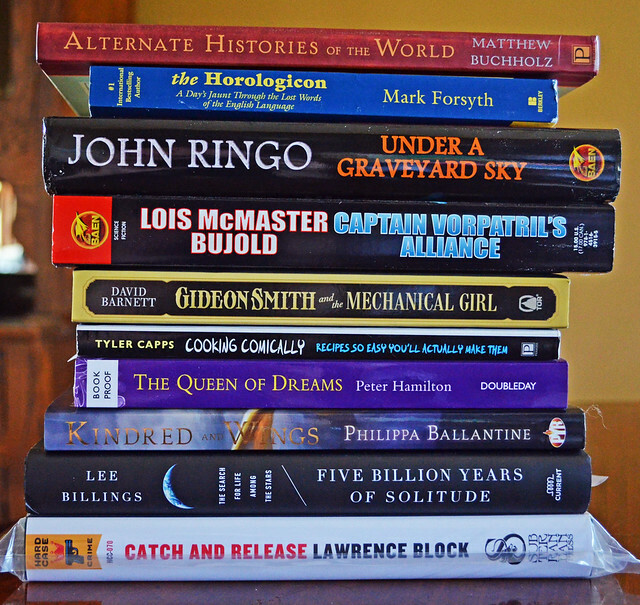 Some of the new stuff that’s out now (or soon will be) that’s arrived at the Scalzi Compound. Any of it look good to you? Share in the comments! Please check them out before you query for a Big Idea slot. The updated guidelines are here. Please feel free to share them with other interested parties. Can’t complain about that. Also, “Hugo Award Winning Author” or some variation of it is likely to be added to the covers of the other books as they go to reprint. 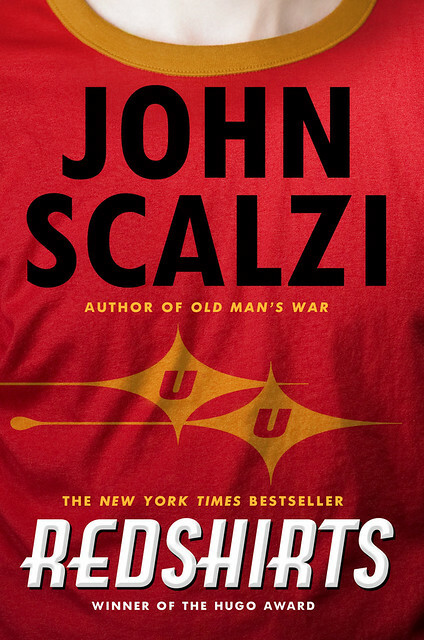 Those of you aware of my history may ask, as the Redshirts win was actually my third Hugo, why we haven’t mentioned Hugos on book covers before. The short answer is that the other Hugos, while awesome, were in non-fiction categories, and neither I nor Patrick, my editor, felt it would have been appropriate to use them as cover page marketing for my fiction work (we did note the Hugo for Hate Mail in the bio material, which is usually inside copy). This is not to cast aspersion on anyone else who does or would, mind you; with so many things, this is a personal judgment call. Now that I have a Hugo for fiction, it’s full speed ahead. Can’t wait to see this cover on a printed copy. Some books take longer to write than others. Channel Zilch took longer to write than most. But to be fair, author Doug Sharp has a very good reason for that. Here he is to explain. In the mid-80’s I was at the top of the computer game industry. I designed and coded two hit games: ChipWits (co-created with Mike Johnston) and Cinemaware’s The King of Chicago, which sold over 50k copies in 1987. Those were heady times: winning awards, garnering reviews that made my Mom proud, giving conference presentations on Dramaton (my interactive narrative tech), and bouncing proposals off producers at the biggest game companies. I sent Activision a 3-page proposal for a game called Future Cop and they bit. They coughed up a huge advance to create it. In 1988, six months into development, disaster: hammered by out-of-control epilepsy, I could no longer program and could barely hold a conversation. Future Cop died. I struggled to remain vaguely human. I spent the next three hellish years pounded by seizures, trying permutations of mind-numbing epilepsy meds, and considering temporal lobe surgery. I decided to build a story-telling screensaver. Screensavers were big business way back then and I could use my Dramaton platform to script the action. Groping for a gripping tale, some perverse bundle of neurons in my brain birthed the indomitable Heloise Chin, scarily manipulative protagonist of Channel Zilch. In the wake of her creation trailed the shuttle-swiping storyline, characters I loved (and love), and a Big Fat Juicy Idea. Life intruded on writing when, through some cosmic prank, I wound up working as a minion of Bill Gates, eventually managing and coding in Microsoft Research’s Virtual Worlds Group. I couldn’t write my CZ screensaver at night while coding VR tools all day so I decided that Channel Zilch would be literature, not software. In the fifth grade I remember looking at a blank sheet of paper and thinking, “I can write anything on this page—total freedom!” That’s when I decided to become an author. My game career intervened. 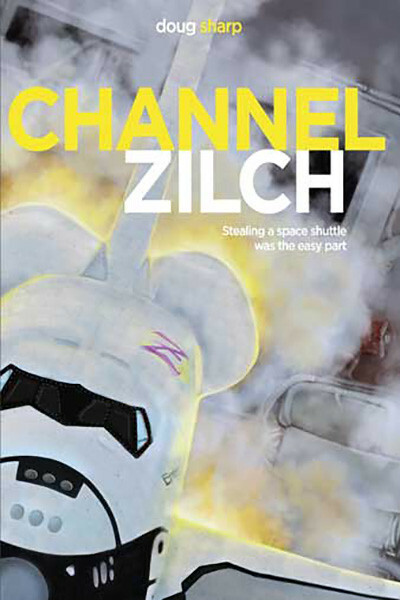 So I was pumped when it hit me that Channel Zilch would make a rip-roaring novel. I coded cool cyberspace tools all day and wrote when I could. I finished the first draft in 1995 and got some great crit from MSFT buddies. In 1992’s Channel Zilch, the Big Idea was to kickstart the Internet. Steal a space shuttle, hijack a high-bandwidth military satellite network, and turn it into a worldwide public net. Space Opera and Bandwidth to the Masses! As those of you who can legally drink are aware, things change in 21 years. Bandwidth is pervasive. CZ’s original Big Idea became a quaint anachronism. My life changed drastically in the 21 years of Channel Zilch’s gestation. In 1997 my epilepsy attacked with new ferocity and pummeled my brain for 6 years, causing severe cognitive loss and damaging my thalamus to damn me to the hell of Central Pain Syndrome. CPS tortures me constantly by scrambling pain signals. I can no longer play a computer game, much less create one. From my pain and my loss I forged a new heart and purpose for Channel Zilch. My life’s purpose is to do my damnedest to help cure CPS, to free myself and millions of fellow sufferers from neural hell. Channel Zilch became my way to realize that purpose. I introduced a character suffering from CPS to give Hel a new goal: to cure Central Pain Syndrome by figuring out how the brain works. Hel decides that the quickest route to a cure is rapid advance in AI. Heloise’s life’s purpose became a quest to recruit hordes of geeks to work on AI. Channel Zilch’s new Big Idea is that one extraordinary person could kickstart the Singularity by mobilizing the geeks of the world. Heloise Chin is that extraordinary person. Hel sums up her goal in a maxim she calls Hel’s Bet: “Work for the Singularity to max your odds of living long. Don’t bother if you’ve got a taste for dirt.” Pascal’s Wager 2.0. Stealing space shuttle Enterprise became a PR stunt to focus the world’s eyes on Heloise Chin. Channel Zilch’s Orbiting Reality Show became a bully pulpit for Hel to extol a romanticized geek-bait Singularity–to taunt and goad and lure geeks to dive into the intimidating world of AI development. Her goal is to make coding an open-source Singularity the Geek Holy War. Sci-fi changes the world because geeks who build the future read it. No Heinlein, Asimov, Clarke: no space program. Maybe Hel’s crazy Bet will pay off. Writing is painful for me. I need an aide to help me outline chapters because my cognitive loss makes it impossible for me to put things in linear order. I pushed myself because I was sure that writing the Hel’s Bet series would be my one small contribution to encouraging the brain research needed to cure CPS. Last year I was fortunate to help found the Central Pain Syndrome Foundation and now serve on its Board of Directors. Panverse Publishing and I will donate 10% of our profits from The Hel’s Bet Series to the CPS Foundation. Visit the book page. Visit the author bio page. Follow him on Twitter.